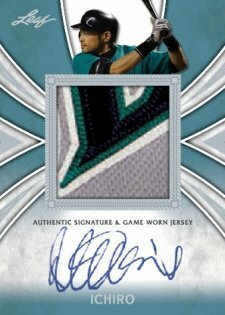 Leaf is offering a first look at the Ichiro Suzuki autographed patch cards found in 2011 Leaf Metal Draft Baseball. 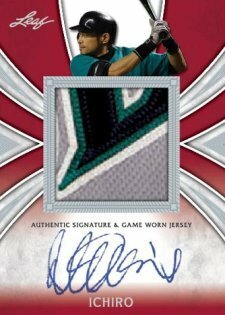 Leaf made the switch from regular autographs to patches after the original cards were damaged in transit. 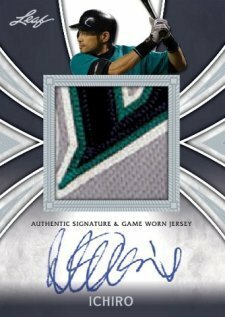 Inserted as redemption cards, they will be filled within 30 days and include four autographed variations numbered to 99, 25, 5 and 1. The cards are done on thick 120-point card stock with silver foil etching. All the autographs are on-card. Leaf will be adding to the security of the cards by maintaining a database of the patch pieces that will be published on the company's website.